Condition: Acceptable. Includes a case and a compatible monitor. This is actually the same console as the Hog1000 console, but Jands built it first, and it has an older physical appearance. 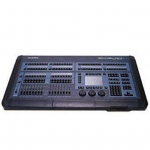 Despite its age, it is still a very useful console: it has 2 DMX 512 universes, 16 playback faders, 1 external monitor jack, and 64 palette buttons.